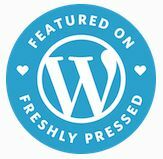 Eyeball to Eyeball: Fifty Years after the World-Saving Blink | "Granny Beads and Grocery Store Feet"
One of the photographs that started the crisis. The history surrounding the Cuban Missile Crisis is well-known and has been the subject of articles, books, and university classes for the past five decades. It was one of — if not THE — hottest points of the Cold War. For the only time since its inception in 1959, the US military moved the DEFCON alert readiness to DEFCON 2 prompting Strategic Air Command — again, for the only known time in history — to launch the nation’s fleet of B-52 Stratofortress bombers to their airborne orbit points in preparation for an imminent nuclear retaliatory strike against the Soviet Union. What is not common knowledge is the crisis actually involved some live fire and one American pilot gave his life to obtain the information that would ultimately move President John F. Kennedy to put his finger firmly on the “Big Red Button” and issue the ultimatum to Soviet Premier Khrushchev to remove the missiles immediately or face World War III. What is even lesser known than THAT is the only casualty of the Cold War’s hottest moment was born and raised in Greenville, South Carolina just up the road from where I am writing this. He also graduated from my college alma mater, Clemson University. His name was US Air Force Major Rudolf Anderson and around these parts, he is a really big deal. This is Maj. Anderson’s memorial plane in Cleveland Park, Greenville, SC. I grew up visiting Cleveland Park and the Greenville Zoo on weekends and each time we would go, Papa Wham would take me by “The Big Plane” as I called the memorial Greenville had erected to Maj. Anderson’s memory. The monument still stands today and all this year it has been undergoing extensive renovation and improvement in preparation for a rededication Saturday, October 27, 2012 to mark the 50th anniversary of Maj. Anderson’s death. 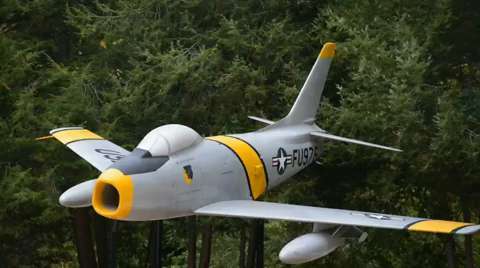 The memorial’s centerpiece is an F-86 Saber jet fighter of the type and markings Maj. Anderson flew during his service in the Korean War. The Air Force donated the Saber because the U-2 type spy plane the major flew on his fatal mission was such a new plane with so many top-secret systems they could not release one. At the time of the Cuban Missile Crisis, the U-2 was the best kept secret in the US. It was a sophisticated spy plane able to fly so high the pilot had to breathe pure oxygen and wear a space suit. When the U-2s first flew, the thought was the Soviets had no interceptors or anti-aircraft missiles capable of reaching the altitude necessary to bring a U-2 down. Unfortunately, the Air Force learned that if you shoot enough missiles at an aircraft, the law of averages starts to work against you and the first U-2 was shot down by the USSR on May 1, 1960. 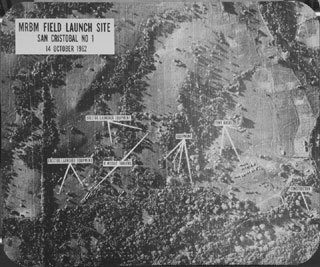 Even though they now knew the U-2 was vulnerable, the Air Force brass still used the plane to great effect and it was the pictures taken by Maj. Anderson and his fellow pilots earlier in October 1962 that provided the photographic evidence needed to for President Kennedy to confront the Soviets. Major Anderson knew the danger he was flying towards as he took off fifty years ago, but he went anyway and his death, terrible as it was, gave the President the excuse to issue a final ultimatum to Khrushchev to remove the missiles or face annihilation. My mother was ten years old during the events of October 1962 and she recalled daily “duck and cover” drills in school for those two weeks. I think it shows more than a little naiveté on the part of the Civil Defense people to think that a textbook and a school desk would provide adequate protection from a hydrogen bomb, but those were simpler times. Thankfully, as I alluded to in the title, Khrushchev and the Soviets backed down and agreed to remove the nukes from Cuba. The hottest spot of the Cold War thankfully cooled down and the mushrooms never started popping up. The world could breathe a collective sigh of relief and I take a lot of pride in the fact that a South Carolina boy, in giving his life for his country, was a big part of making it possible. Rest In Peace, Major Anderson; and well done.